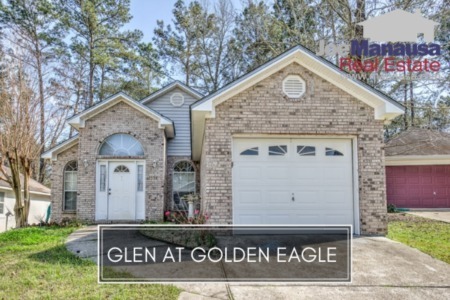 Located on the NE side of Tallahassee and serving as the center piece of Killearn Lakes Plantation, Golden Eagle offers large executive styled homes in a gated golf course community. Golden Eagle (the neighborhood) is wrapped around the most challenging and picturesque golf course in Tallahassee. Golden Eagle Country Club features a Tom Fazio golf course, 18 holes which feature plenty of water and sand and is more than a handful for even the best of Tallahassee's golfers. If you are serious golfer, Golden Eagle Plantation should be your first stop. 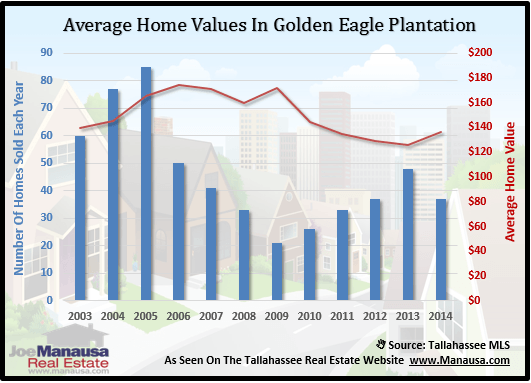 In this report, we will look at prices, values, and sizes of homes in Golden Eagle Plantation, as well as show current listings in the Tallahassee MLS and all closed home sales going back to 2003. For all of the three real estate graphs found in this report, you will find the number of closed home sales for each year (blue columns, measured on the left vertical axis), and an important real estate statistic shown in red (measured on the right vertical axis. It is important to note that sales are through December for all previous years, but through November in 2014. Average home prices have risen 7% in 2014 versus 2013, but still sit well below the peak of the market prices established in 2007 (not counting the one atypically large sale in 2009). Distressed sales are are occurring at a rate a bit lower than other neighborhoods in Tallahassee are seeing, but consistent with similar neighborhoods filled with homes of higher values. The average recorded sales price is $439,500 for Golden Eagle Plantation thus far in 2014. Home sales activity this year are the second highest than what we have seen over the past eight years, but still well below the levels recorded during the most active years from 2002 through 2005. Thus far in 2014, there have been 36 closed home sales in Golden Eagle Plantation. 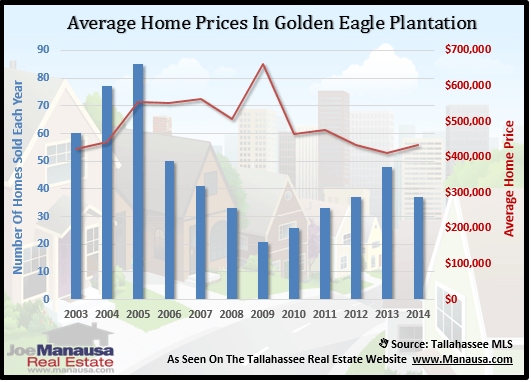 Average home values in Golden Eagle Plantation have risen 9% since last year, recovering very nicely from the market bottom recorded last year. Through November, the average value of a home sold in Golden Eagle Plantation has been $137 per square foot. This is up 9% over the bottom reached in 2013, but still down about 22% from the market high set back in 2006. This means that many homeowners who have purchased or refinanced in the past 10 years are likely at zero or negative equity situations. 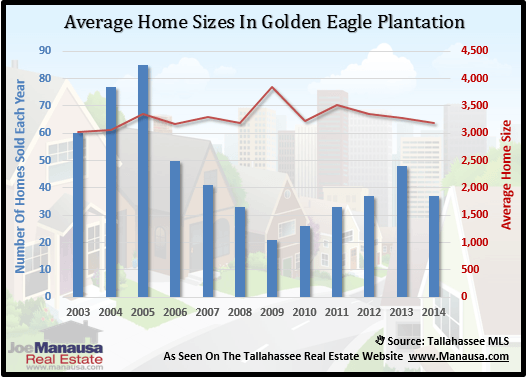 The average home size sold in Golden Eagle Plantation typically falls in a range of 3,000 to 3,500 square feet, and this year buyers have been selecting homes homes right in the center of that range. The 36 sales thus far in 2014 have averaged 3,210 square feet. 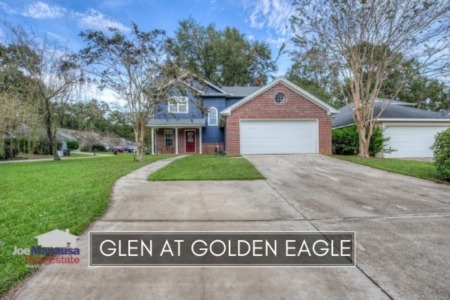 The following list of homes are the most recent listings in Golden Eagle Plantation. The following list shows home sales going back to 2002 in Golden Eagle Plantation. I hope you enjoyed our December 2014 update on home sales in Golden Eagle Plantation, please feel free to drop me a note if you have questions not covered in this report.